Only Tadashi could pry me out of my uptown apartment with the weather frying all of us the way it has been. 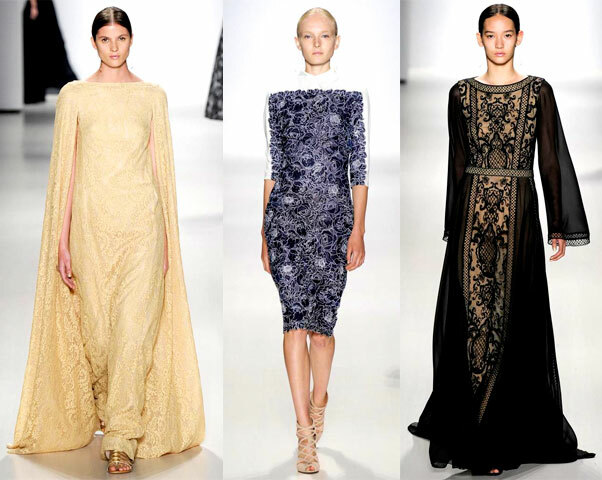 New York City has been beaming, but with grace, elegance, and the air conditioner of Lincoln Center, Tadashi took our minds off this absurd weather, and focused them on knee & floor length lace gowns. With award seasoning becoming more about what the nominee is wearing instead of what they could possibly be winning; Tadashi has become a strong contestant for the upcoming award season. These gowns are perfect for any lady wanting to be crowned best dressed, especially this gown up in the upper right corner “Taken By Me“. I was so thankful for a model with a steady pace walk. 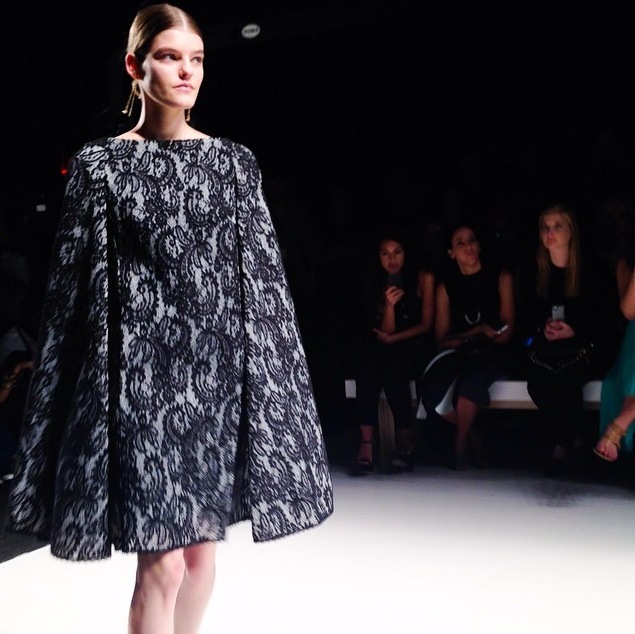 I absolutely adore a cape on a dress, it’s the grand illusion it creates. Truth is, the women always get the best garments. If you take a look through this season’s lookbook you find a refreshing number of gowns just ready to make it off the runway, thanks to the different buyers. I Really want to showcase this gold gown with the floor length cape. Tis is to die for, but before I get to that look, feast your eyes on this blue frock to your left. Can you see Michelle Obama in this? I think I can the blue color would go great with her skin tone. Enough Politics, this was a very appealing dress, and will complement any skin tone. 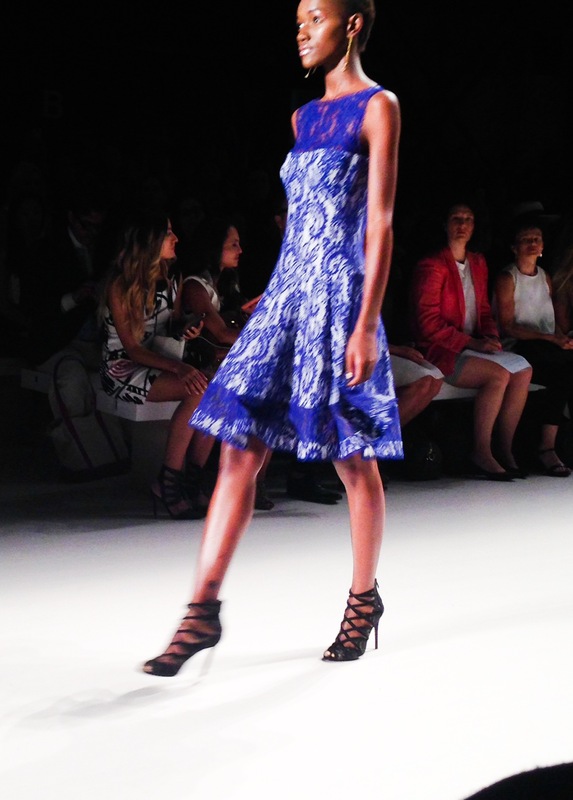 I hope you ladies are a fan of lace, because that Fabric was the main subject of Tadashi’s show. I’d like to think this show represents a certain women. A women who know’s how to act like a lady, but is a boss with class. Picture it, Yes I’m standing here in this floor length lace dress, but it’s up to you to remember me, and not the other way around! I adore a well dressed powerful woman. I can be totally honest, and say I had more than 10 favorite looks from this collection, and that’s the lowest I can go. I was a fan of 90% of the looks, and when people ask me what’s my been some of my favorite shows of the season thus far I always say Tadashi first! I didn’t forget about showing you the gold gown, and two others that I thought you needed to see.